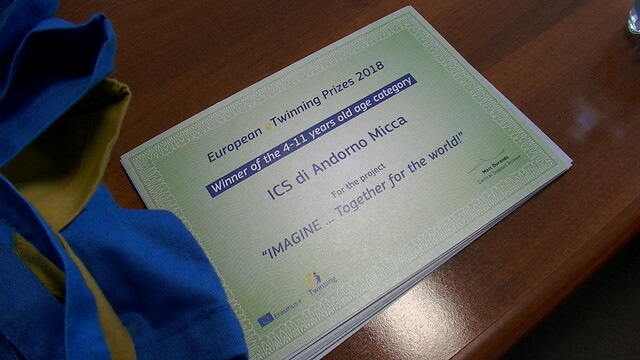 On 23 April, the awarding ceremony of the 2018 eTwining European prize took place at the school district Adorno Micca (Biella). The teacher Emanuela Boffa Ballaran and her students received the official prize as winners of the 4-11 years old age category with the project “IMAGINE… Together for the world” on the current issue of migrants and social integration. The project had already been awarded the 2016/2017 national eTwining prize. The event was participated in by, among others, Santi Scimeca (eTwining project manager), Francesco Laera (Italian representation of the European commission), Giacomo Bianchi, Giulia Felice e Lorenzo Mentuccia (e-Twining Italian national unit) and representatives of local administrations. Also the Greek class, partner of the project participated in video conference. The eTwining European prize represents the main award of the community for school projects carried out during the school year. Besides the teacher of the school in Biella, there were other 7 Italian teachers awarded this year in the 11 categories foreseen. The awarding ceremony will take place during the 2018 eTwining ceremony scheduled in October in Warsaw.